Ben’s bedroom is the box room upstairs. When we first moved in 3 years ago this box room had floor to ceiling cupboards along one wall meaning there was no room for a bed/cot. Luckily Ben was only 6 weeks old when we moved so he was still in with us in his moses basket. In the first 6 weeks of us living here Gordon removed all the cupboards and stripped the terrible wall paper off all 4 walls leaving bare plaster. I didn’t want such a little baby breathing paint fumes but we couldn’t squash him into his moses basket any longer so at 13 weeks old we decided to move him into the cot in his own room and paint at a later date. The plan was to sort out some boxes that were stored in our bedroom, move the cot in for a few days and paint the box room. Simple. Yeah, right! Fast forward 3 years and Ben’s room is still bare plaster! He has moved out of his cot and into a bed, but nothing else about his bedroom had changed. Actually that is not entirely true because a few weeks ago Gordon started looking at the state of the plaster with a view to begin painting. There was a small crack underneath the window and he started chipping it out. After a while the small crack had turned into this. And this is what Ben has been living with. His bedroom – the before shot. So when I saw Money Supermarkets Room For Improvement challenge I almost jumped for joy! This is it, the perfect excuse (challenge!) to make over Ben’s room on a budget! It would really focus us and once I had committed to doing it there would be no going back! So Money Supermarket gave us our budget of £50 and the clock started ticking. First things first, we had to fill that hole (I say we, I mean Gordon!). He also had to “chase out” some other cracks before re-plastering could begin. By the end of the morning on day 1 it didn’t look good. Yes that’s right, more holes. And this time you can almost see daylight through them. A quick trip to B&Q for mortar was suddenly required! The afternoon of day 1 went better though. 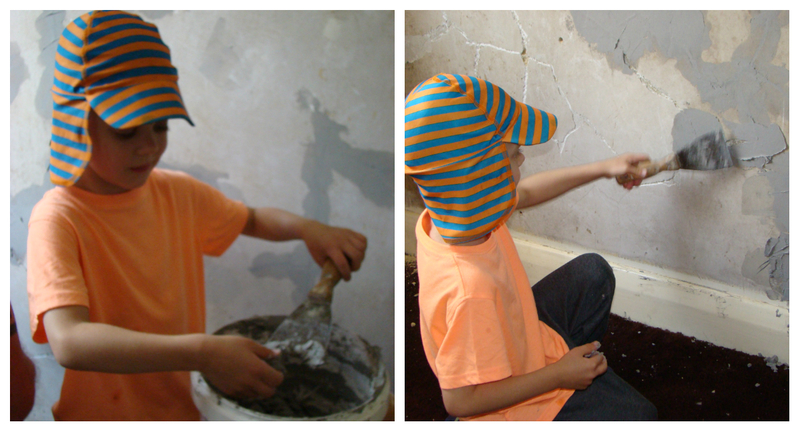 Gordon filled the huge holes in the wall while Thomas did some plastering. 5 year olds really can plaster you know! By day 2 it was starting to look better. There were almost 2 walls that could be painted. Painting is my job so I set to work while Gordon continued plastering. We had decided to use an Anti-mould paint because Ben’s room gets very damp. This did push the cost up but it was something we weren’t willing to cut corners on. Day 3 and the last full day we had to spend on the job. We still only had two walls painted and only one coat of paint on those 2 walls. The other two walls still needed the plaster rubbing down and checking before we could start painting them. We also still had shelves to put up above the picture rail as storage for games and other random stuff that needs a home. I honestly wasn’t sure we’d manage it at this point. Somehow, somehow, we did it! We managed to get the plastering rubbed down and all four walls painted. We did only put two coats of paint on two walls, whereas the others had three coats but it looks fine. 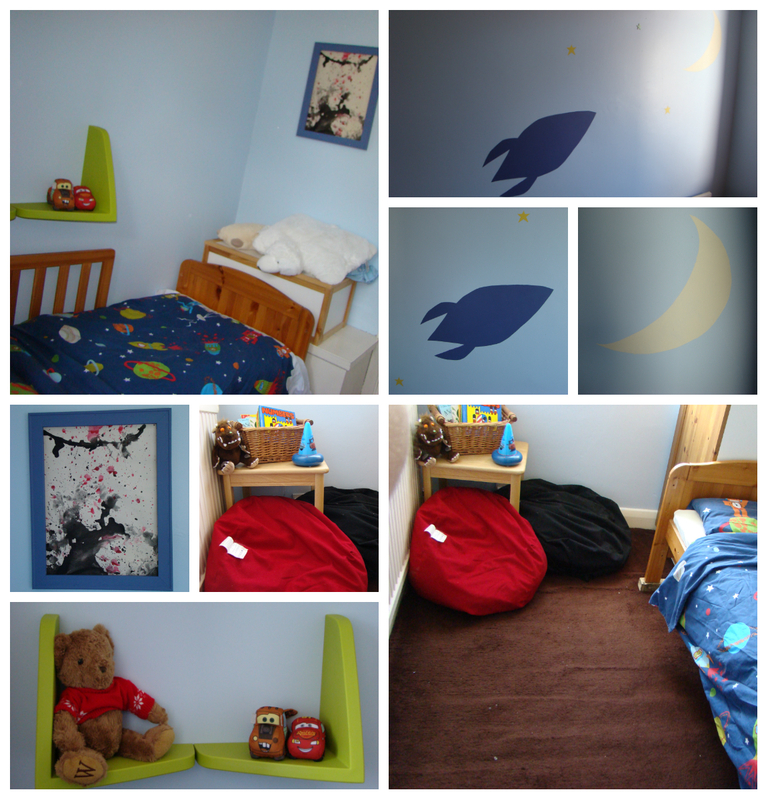 Gordon got the shelves up and then drew some space themed shapes on lining paper we keep for kids art and we stencilled them on the wall using a dark blue tester pot of paint, and some magnolia and yellow paint we already had in the garage. He put the new space themed lampshade up that I had bought in Wilkinsons . We also found a couple of shelves that were previously in the twins room, so we put them up above Ben’s bed for his toys and teddies. Today I have added the final touches. I painted an old wooden picture frame using the same dark blue we used for the stencils and fastened part of a painting the kids did yesterday to it (I thought the picture had a galaxy feel to it so fitted in nicely!). I have hung this on the wall at the end of the bed. I also found a wicker basket under our bed that wasn’t being used, so gave it a clean and placed it on an old coffee table with some books in. With the beanbags we already had this has created a cosy book corner. Finally we added some glow-in-the-dark stars to the walls to complete the space theme. I am completely amazed and thrilled with how the bedroom has turned out! Ben loves it and keeps talking about his new room, his pictures, his books, his stars, his shelves! And finally, the budget. how did we do. From around the house: plaster, green shelves, screws/nails etc, coffee table, bean bags, wicker basket, picture frame, yellow and magnolia paint. Home improvents don’t have to cost the earth. Fact!